Two people received critical injuries following a crash with a school bus in Covington on Monday afternoon. A serious crash between a school bus and SUV in Covington Monday sent two people to the hospital with critical injuries. Seven students on the bus received minor injuries. Police and fire crews responded to the crash in Covington at the 16500 block of Covington Sawyer Road. Sgt. 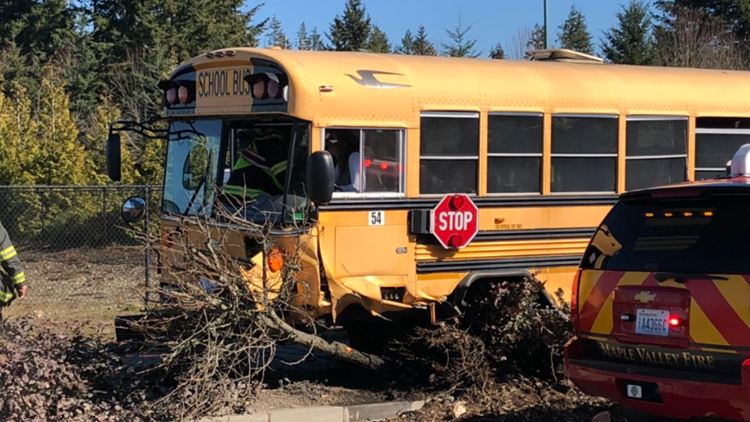 Ryan Abbott with the King County Sheriff's Office said the SUV attempted to pass another vehicle and make an illegal left turn at a red light before slamming head-on into the bus. None of the students sustained injuries severe enough to require medical transport. Abbott said 28 students from Kentlake High School were on the bus at the time of the crash. The driver and front-seat passenger riding in the SUV had the worst injuries and were transported to the hospital in critical condition, according to Abbott. Three of the four passengers riding in the back fled the area following the crash. Officers captured the three passengers a short distance from the scene. The road will be closed until officers conclude their investigation. A new bus picked up the students a short time later to transport them home. Puget Sound Fire tweeted a photo of a bus following a serious crash in Covington.